A practical guide to the art of preparing and delivering Bible talks. A practical guide to the art of preparing and delivering Bible talks. 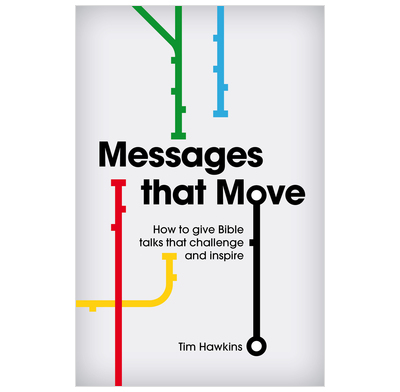 Seasoned preacher Tim Hawkins urges us to give 'Messages That Move' which take people on a journey to a worthwhile destination. Learn how to plan and prepare a talk and lead to genuine transformation through the gospel. I have read a number of books on how to preach, how to present and how to communicate messages. Tim Hawkins brings an alternative approach using the train journey as the illustration throughout. The style of writing is instructional and informative and yet creative. This has been the most helpful book I have read thus far relating to improving preaching. If you've heard Tim Hawkins preach, then you know what to expect from this book. Tim's goal is to have your listeners engaged and he gives practical advice on how to make that happen. If you are after a book that tells you how to preach through a passage, this is not your book. But if you are after a book that helps you improve the delivery and reception of your message then this book is definitely worth reading. In particular I think anyone who speaks to Youth/Young Adults would find this very helpful. An accessible read for anyone who prepares talks for ministry purposes. The style of the book may not be to everyone's taste but the message is inspiring and the clever way the book is put together is a model for the methods that Tim Hawkins suggests. My talks for children's groups have been transformed after reading this book: got me even more excited about plunging deep into a passage to bring out what God wants to come out of the Bible passage, and to experiment with different ways of presenting. I bought an extra copy of this book, having picked up my first copy at a Christian conference, in order to give to someone else.